As CA66 is also having an IC, we would like to bring you our first TKL design to TKL lovers which we already held a GB in TW and CN. Doppio. Doppio is Italian, which shares the same meaning of "Double" in English. Refers to the top dual layers visual effect we want to perform. We tried to make Doppio simple, but look exquisite with neat lines and rounded corners. No brass weight or anything else which is luxury. This version with name plate was made for modding with a stock membrane wireless keyboard. Now we give it some changes, to make it into a wire version. We put indicators in and made a trick of them, according to the concept "layer by layer". And removed the name plate, engraved the Doppio name in bottom plate. About white color, we sent a failed CA66 case to try by using electrophoresis. Looks glossy right now in pics. We'll send another sample to see if we can do matte finish. If not, then white will be look like these. Since everything of Doppio is pretty ready for GB, we already put it in our site. Don't care about the timer. We are now waiting for payment provider to approve credit cards paying (Paypal is good to go though). You can subscribe via email to get the first news when Doppio is alive. Not personally a fan of TKL layouts too much, however this is a really nice design. I'm liking the bright white finish! How is it done? Is the RGB underglow pre-soldered? Also, are both the aluminium and brass plates ISO compatible? Yes, all components are presoldered. All plates support ISO. New renders are up. You will be able to see all case colors and plate colors. Brass plate and PC bot plate are also available. Not really feeling it. For $245 I feel like it should bring something novel to the table, not just the pretty. I am not sure what special features are you looking for. As we mentioned in design concept, it's pretty surrounded by the name "Doppio". Surly we can put other elements in for meeting "novel", but that's not what we were aiming on. And it usually raises the cost which might make the final price over 300 to 350USD normally. There will be new designs coming up in the future. Hope you will find them special and like them. 1. Can I have a closer photo of that white finish? 2. Is it possible to order the polycarbonate plate AND a normal aluminium bottom plate? 1. We'll take some photos once we get the white prototype. 2. Sure, some parts are available to purchase for extra. 3. The blockers are for 7u layout only. You can choose WK version for using a normal 6.25u spacebar. I'm definitely in for one, can't wait for the groupbuy to start! 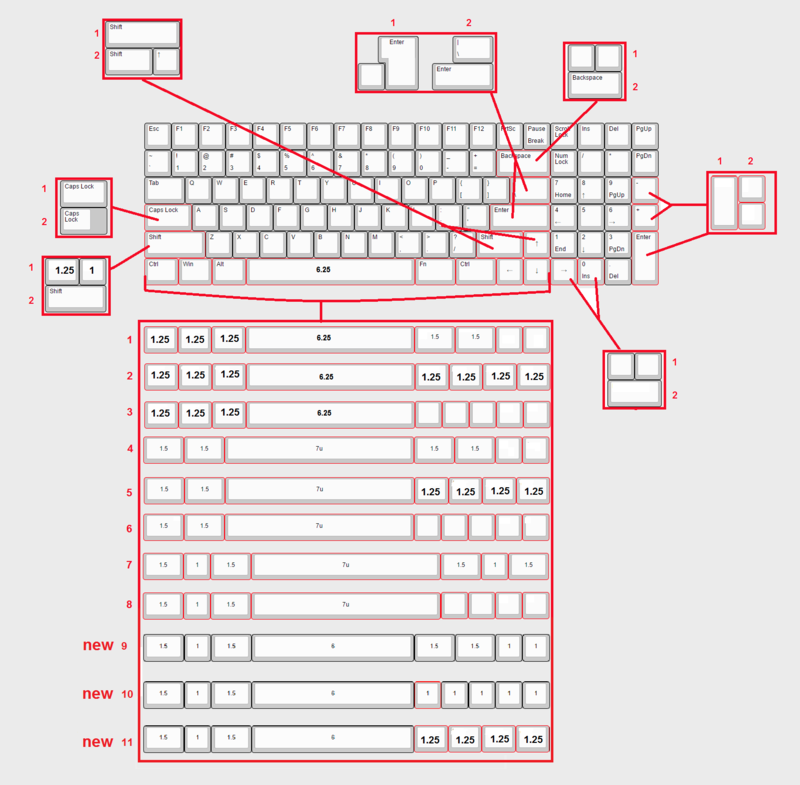 For the winkey version, is there some kind of diagram showing all of the supported layouts? Something like this would be incredibly useful. There you go. Wasn't thinking about to make one since there's not much requires attention. Rough pics shot by factory after CNC. It's been sent to another place for doing eletrophoresis. Hope it'll be finished soon! White color sample with matte finish pics updated. Shot by the factory and a mobile phone. That white looks sooooo goood!!! Can't wait for this GB. Is there a rough estimate as to when it will start? We are doing a small pre-sale for 20 sets of WKL(only WKL) version made in advance. If you guys are interested in getting one WKL Doppio, please send me a PM for pricing. The official GB will be hold after CA66 GB is done. 5 sets left! Can not wait to get our hands on one!